Enjoy the fantastic view from the Panorama Terrace at 3.250 m! There is no easier way of conquering a 3,000 metre peak in Zillertal! Gondolas provide an effortless ascent over the 1,750 metres in altitude difference from Hintertux to the Gefrorene Wand. The ride up is an experience itself! Here you can enjoy the seasons of spring, summer, autumn and winter while safely ensconced in the lifts during your uphill journey. Stunning bird's eye views over the mountains of Tux and Zillertal and the most beautiful panoramas of the Zillertal Alps Nature Park are just waiting for your! You'll love it! - The ascent is wheelchair accessible! 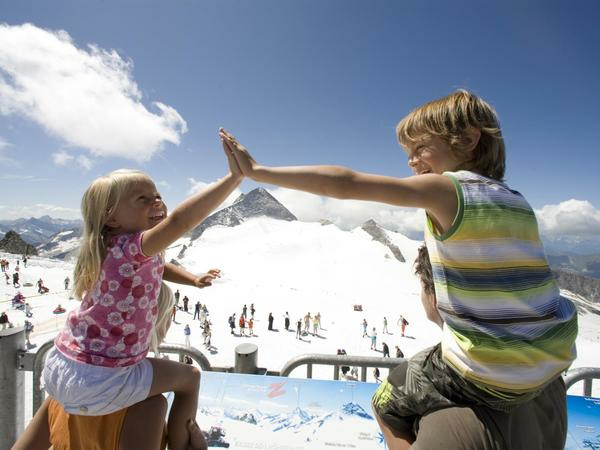 Visit the Panorama Terrace at 3,250 metres above sea level simply and easily with a children's pram or wheelchair. - Specially installed Viscope telescopes are autonomous illustrators of the imposing mountain panorama. - Add to the day's excitement and combine your ascent to the Panorama Terrace with a visit to Nature's Ice Palace and to Glacier Flea Park.